My name is Paul Weaver and I am a tutor on the drawing and Painting Diploma course. 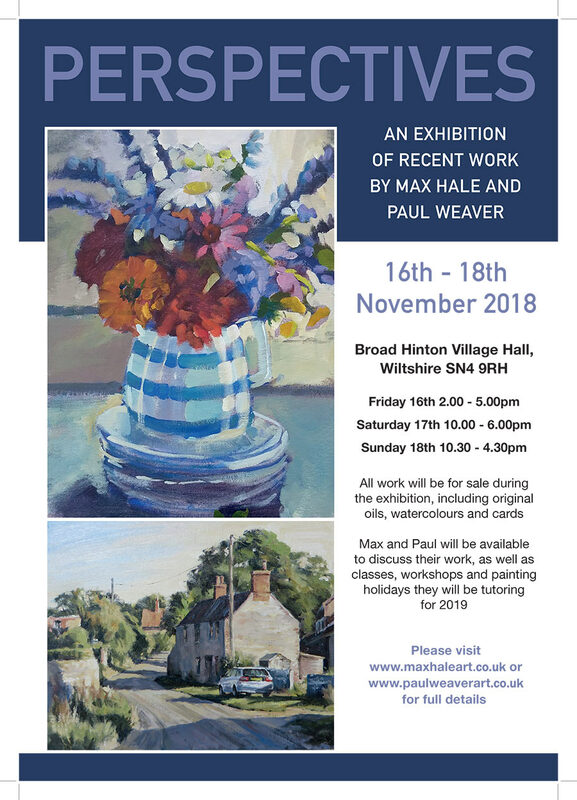 I am having an exhibition with my painting friend Max Hale next month in Wiltshire, UK. I hope that its a chance for any of our London Art College students to come along and see me trying to practice what I preach! If you are a student pop in to find me and say hi! Come and join our new Facebook group! We are thrilled to announce we have a new official Facebook group for all of our London Art college students. 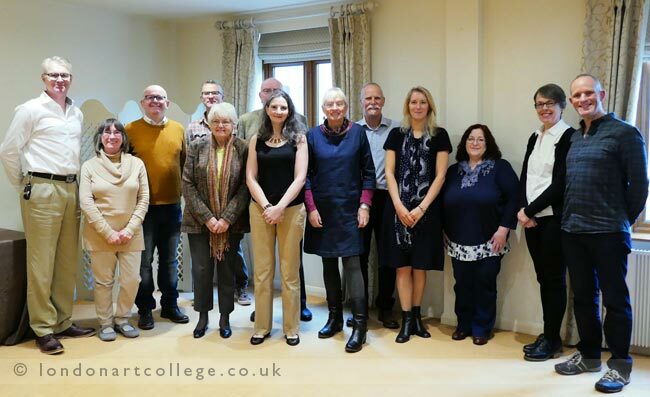 If you have a Facebook account visit our page – London Art College Facebook Group – and ask to join. It is a closed group and so you are welcome to post your artwork in the knowledge only other students will be able to view and comment. 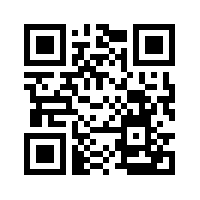 You can also ask questions and advice too! 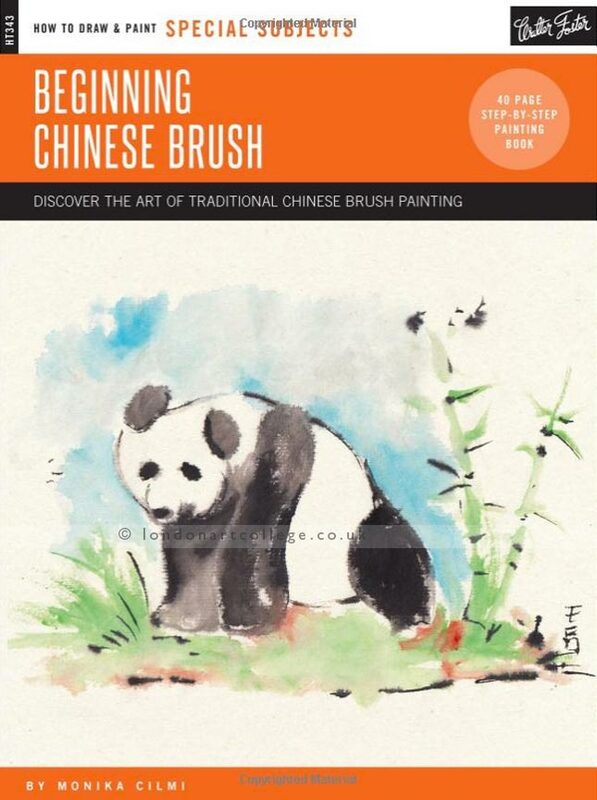 Monika Cilmi’s book ‘Beginning Chinese Brush’ is available..
Chinese Brush Painting tutor Monika Cilmi’s book called ‘Beginning Chinese Brush’ is finally available. The book is structured in such a way to inspire beginners and established artists alike. By following traditional Chinese techniques, it can not only help you become more adept at Chinese brush painting but can also can help you develop your personal work when working in different styles and media. 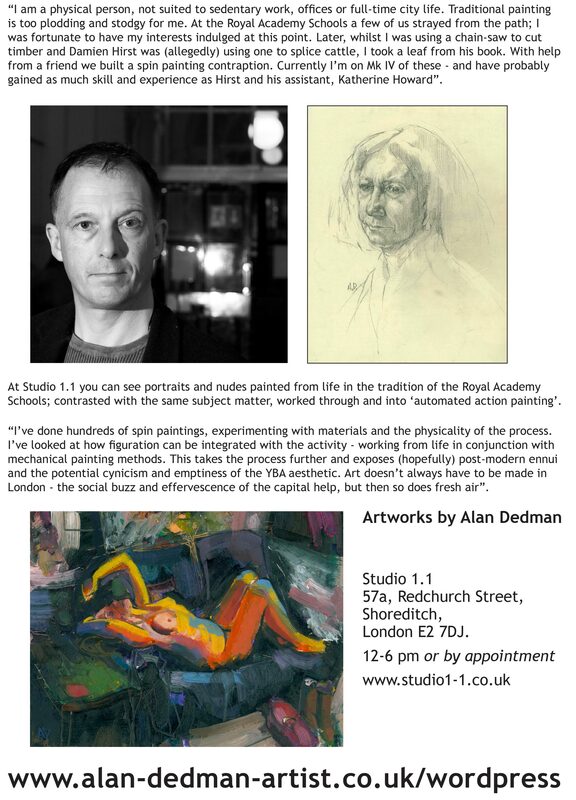 London Art College tutor Alan Dedman is preparing for an exhibition of paintings and drawings (Contemporary Art) from Somerset to central London, during May 2017. The Collective London, has generously offered to host a view-by-appointment show of Alan’s work during May 2017. To make it happen, funds are required for all costs including transport, packaging, publicity, insurance, private viewings etc. Your contributions can help achieve this. Allowing Alan to present an alternative to the mainstream; Art of Classical provenance, lively, colourful and eccentric. Alan Dedman is a UK borne artist. 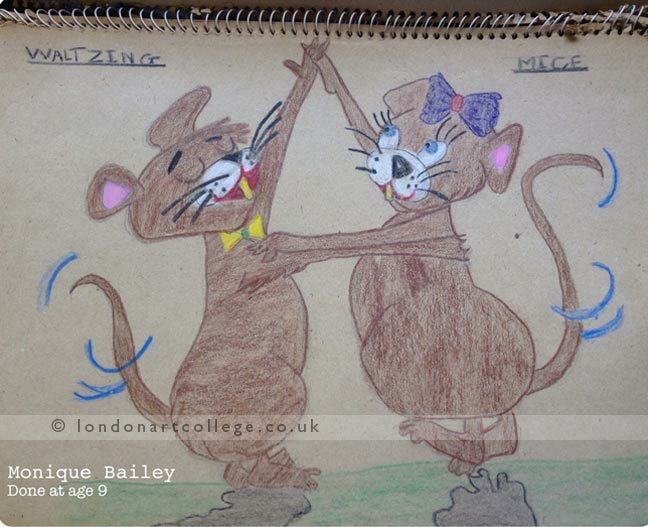 Studied at Great Yarmouth, St. Martin’s and the Royal Academy Schools. Of the British tradition in painting – Alan’s work explodes with energy and colour, bridging the Classical/Post-modern divide. His fine draftsmanship, interwoven with powerful and informed use of colour – create an intimate engagement with human subject matter. 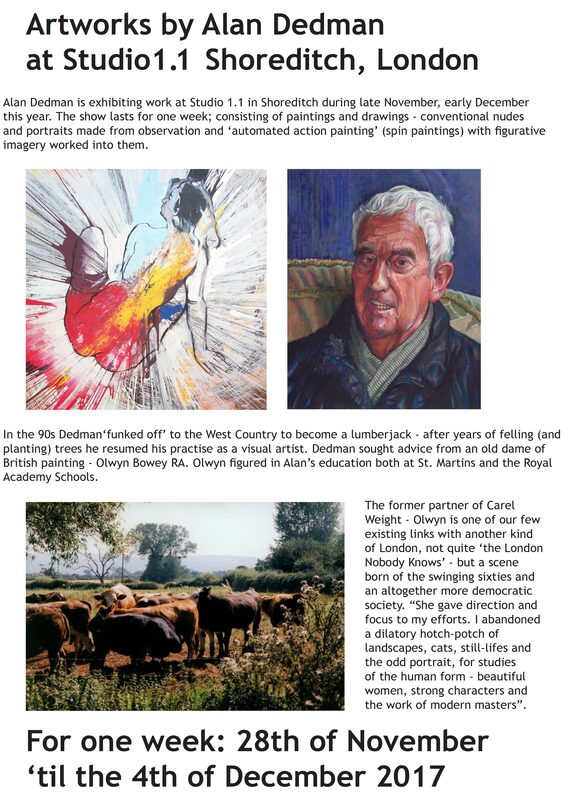 Currently Alan Dedman operates from his studio in Somerset, where he has exhibited during regional arts weeks and in pop-up galleries. Showing in central London will make Dedman’s Art available to a wider audience and create fresh opportunities for future events. If you want to find out more about Alan Dedman’s Art visit his Alan’s Art blog and website Alan Dedman Artist. 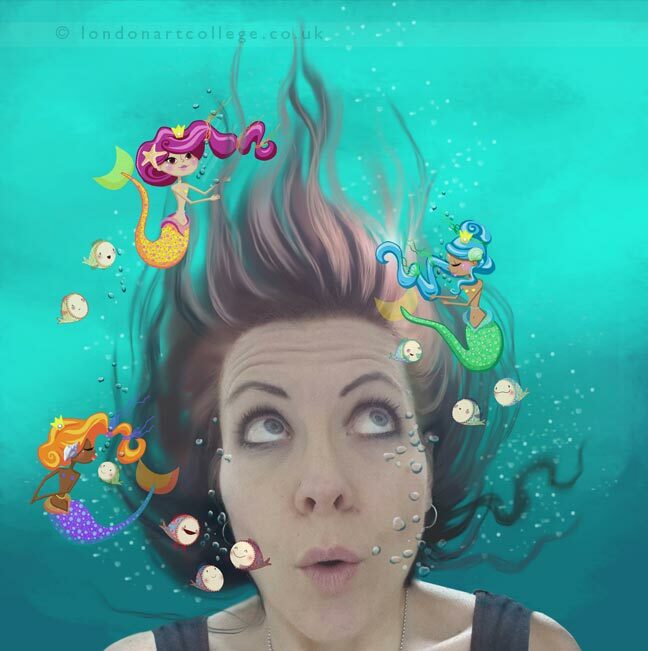 Julie Douglas was a tutor for London Art College for six years, teaching several courses including Coloured Pencil, and the Drawing & Painting Diploma courses. 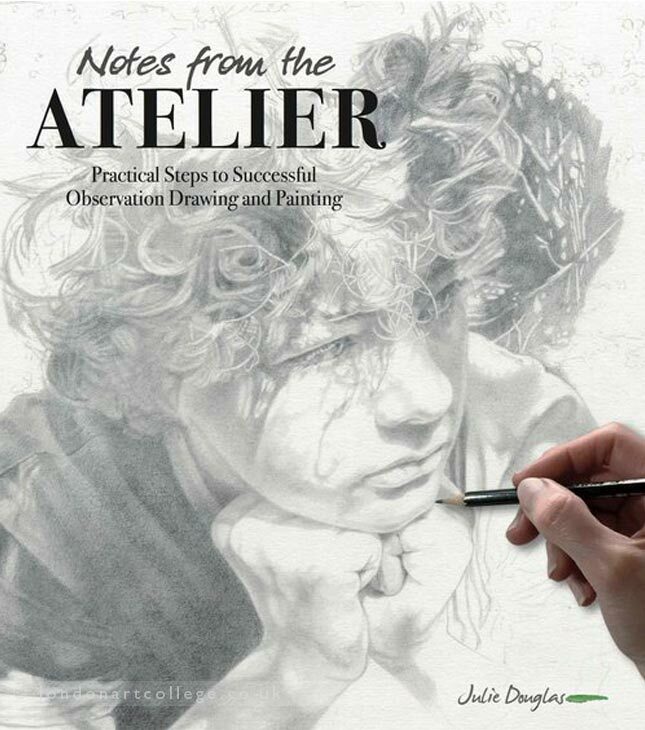 After great pressure from her students, Julie has written a book on drawing and painting, called ‘Notes from the Atelier’. 250 pages of clear and detailed guidance takes the reader through a year of study, with over 500 illustrations by Julie and some of her students, including past London Art College student Mari- anne Leipmann-Schiller! It has taken 18 months to write, as well as 25 years of teaching experience, and Julie is self publishing. In his foreword, illustrator PJ Lynch describes ‘Notes from The Atelier’ as ‘a feast of a book’, and calls Julie ‘an extraordinary teacher’. The book is being printed this week! and it will be launched in April. We are delighted to say that Julie is offering London Art College students a copy of the book at the pre- launch price of £35, plus P&P. After the launch it will be available on Amazon, where the price will be higher. We would like to officially welcome Jarnie Godwin as a new tutor to our team. She will be running our Botanical Painting course. 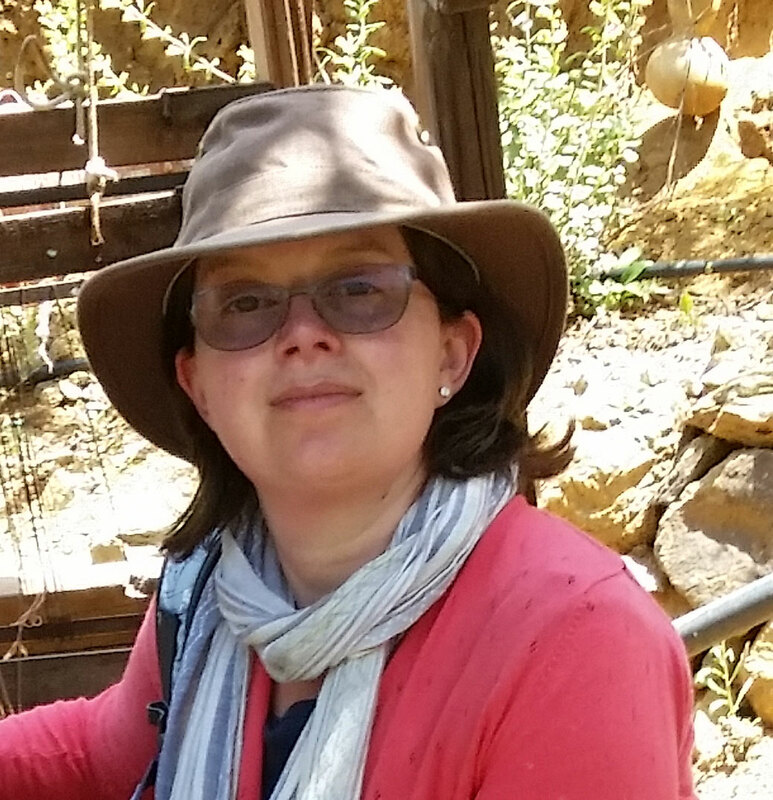 Jarnie has written a very interesting introduction to herself and her work below and we hope you enjoy reading it and are inspired too! Hi, I’m Sketchbook Squirrel. Well, it’s Jarnie Godwin really, originally from East London, now working in Hampshire, and ever since I could hold a pencil and a brush, I have loved to draw and paint. Art lessons at school opened a world of colour and wonder for me, and my favourite teacher Mr. Campbell instilled a sense of fun and quirky charm into every lesson, (I have never lost that). On leaving school, college didn’t follow, but I went straight into a job on a building site as a trainee Architectural Technician in the architect’s office, using the strict disciplines of technical drawing to prepare elevations and plans for new buildings. The job gave me a wonderful grounding for proportion, and the appreciation of structural beauty, but fate intervened and the company folded. Following the creative path this time, I ended up on a college course studying Graphic Design, with a stint working at several advertising agencies in London. Here I was introduced to the heart of creative design, with everything from packaging to posters coming my way. Somehow later along the path, I ended up in teaching, and had some wonderful times during my years in the classroom. A promising career beckoned before fate once more played its hand, and I had to make the painful decision between my health and my job, so I had to quit. Or, one might say, it was the opening door of a new beginning. 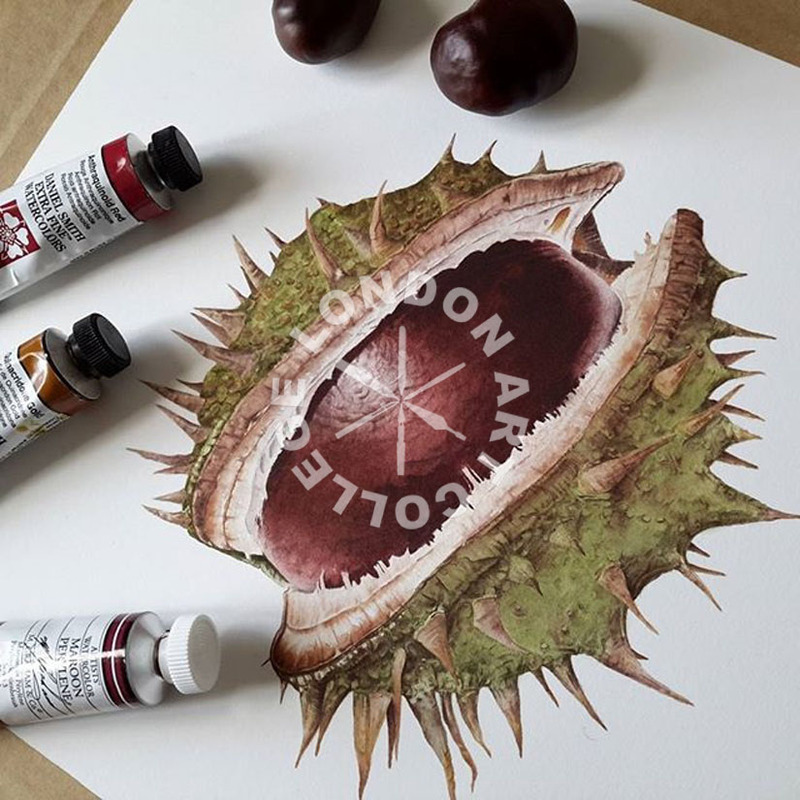 Working professionally as a botanical painter, my watercolour paintings still have a technical feel, drawing on my love of structural proportions and form, but many compositions also reflect the more fun and quirky side of my nature. Looking at a subject, I don’t always see its perfection, but rather its imperfection, with the belief that beauty can be found in all things. Dying tulip blooms, dried seed-heads, and nibbled bramble leaves have all appealed in recent years, along with the perfect blooms of dahlias and clematis. Generally, subjects are portrayed life-sized, but sometimes I will also scale up a bit, by two or three times to create a bigger impact, with deep, saturated colours and dramatic compositions. Tea ching still plays a very important part in what I do, and along with the Sketchbook Squirrel Blog which started while I was still on the SBA course, I continue to teach one and two day workshops, and hold studio days at my Hampshire garden studio. My latest venture has been to launch my own online learning website Botanical so Beautiful, where students can subscribe to view, and work along with video tutorials, practical sketchbook exercises, and the Technique Tool Box of technical advice. 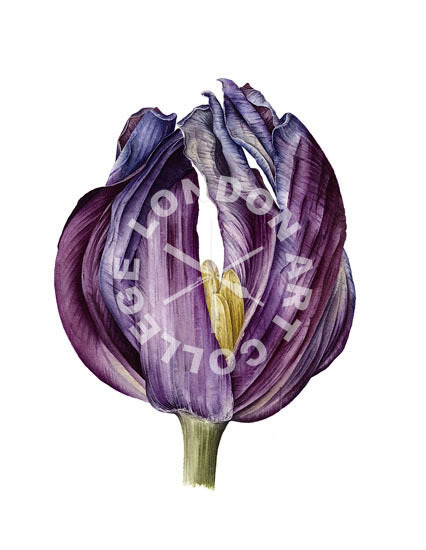 Online learning is such a wonderful resource, and I am very excited to be also sharing my knowledge with the students on the London Art College Botanical Painting Course. 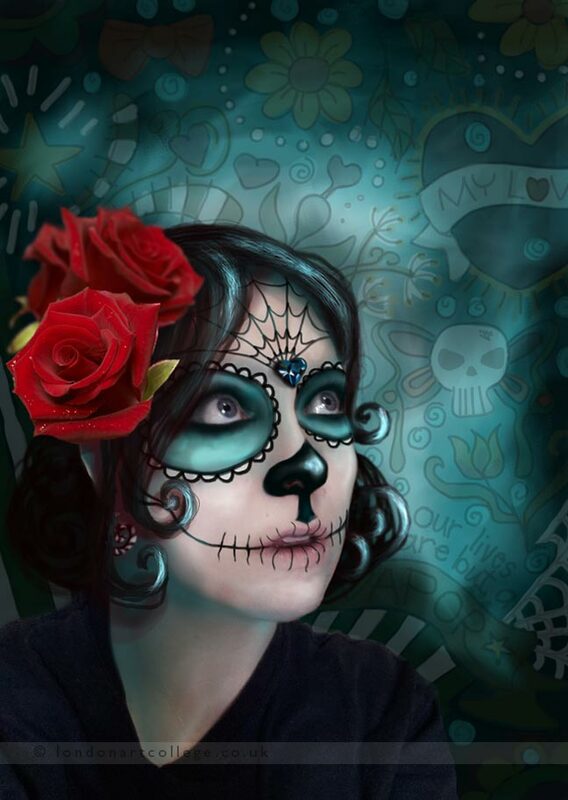 Although teaching is my real focus again now, helping others to achieve their own goals and ambitions with their painting, and introducing beginners to the joys of painting in the botanical style, I still paint myself, and continue to exhibit as much as I can. For me, we are all still learning, evolving our style, and breaking old habits. The day I feel I have learnt it all, I’ll hang up my brush. Well, not as much as some might think. Being someone who started with a very small budget, I have maintained my spendthrift ways, and only spend money where I need to. General studio gear such as china palettes, boards etc. are bought from charity shops, and homeware stores as cheaply as possible. Watercolours though must be Artist’s quality, never the student range. Artist’s quality watercolours always have finer pigments and better translucency, maintaining their vibrancy and clarity. On that point, I only use transparent paints, with only one or two semi-transparent colours making it into the box. These are mainly used as a final over-glaze, and I never use opaque or semi-opaque colours. The cadmiums were ditched a long time ago in favour of the beautifully transparent substitutes. Brushes are the next thing I do like to spend good money on, and although I have tried many of the superb brands available now, I always return to my favourite sable. Da Vinci Maestro 35 with their longer, finer point often lead to them being called a ‘designer’ brush, and I guess as I used to use the very long ‘rigger’ brushes during my design days, I like the feel of these, and the control I get by using them. For my paintings, I use nothing larger than a size 4 brush. The handmade brushes by Rosemary & Co are also a favourite of mine, with the Series 22 pointed designer brushes, and series 323 spotters always finding a place in my kit. 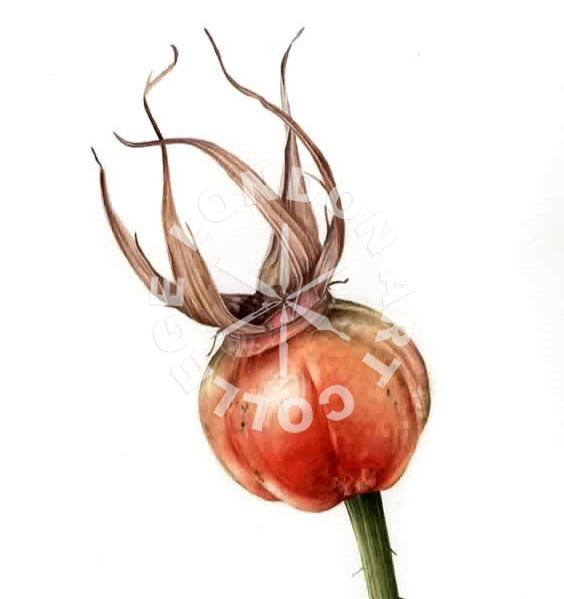 Quality Hot Pressed Paper is the very best surface for botanical paintings. The very smooth surface gives the best medium to receive wet-in-wet paint, while maintaining crisp edges and vibrancy in the colours. With so much variation between the brands, paper I find, is a very personal choice, so it’s always best to sample a few to find your own favourite. Before starting a painting, I always complete some sketches and accurate drawings. It’s important to study a subject from all angles, to really get a feel for it, and how it grows and forms. My sketchbook contains loads of thumbnail sketches and little compositions, some with colour, to get down what I want to do, and how I want it to look when it’s finished. If it doesn’t look good or work out at 4cm, it’s never going to look fabulous at 40! 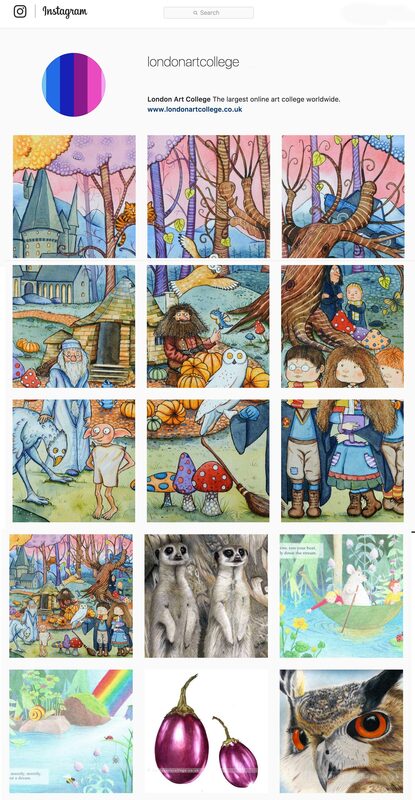 Once the drawings are done, I transfer the composition to the watercolour paper using a lightbox. This prevents any mistakes having to be erased, which can damage the fragile surface of HP paper, but also allows me to use a very light pencil line. Next comes the colour. My method includes some initial wet-in-wet washes followed by dryer brush techniques, and lots of blending to keep a smooth finish and to focus on the finer details and form. The technique sounds complex, but the way I have put it all into a workable, and structured method, actually makes it quite straightforward. Of course, there are many ways to get the paint on the paper, and I always encourage students to find the method that works for them, and to keep practising. That’s why online courses are so good for beginners, as they get you working through exercises and assignments, while discovering new methods and techniques. The safety net of a tutor to help you, also makes the process a lot less daunting. That’s actually quite a hard one to answer. I guess for myself, to be the very best that I can be would be a place to start. When you have a passion for something, it’s difficult to say where it comes from, and what drives it, you just know it’s there, and whatever it is, you want to immerse yourself in it. I mean, I was drawing everything and anything when I was young, and I mean anything, including my mum’s iron! I just had to do it, everything else just didn’t really matter. Even in the staffroom at the secondary schools I worked in, my colleagues would joke about my ‘exceptional board drawings’ to help my students. Often rendered in chalk or board markers I found any way I could to get students motivated for learning, helping them through tough exams, while also having fun along the way. Finding botanical art has made total sense for me, and how I want to paint. My biggest goal now is to get as many people as possible who have that same need to paint discover botanical painting, and even on days when it’s just not working, to love it. Oh, and for me to actually get my series of paintings for the RHS into the exhibition before my allocated 5 years are up. That’ll be 2019! Time to get those brushes working.